Life doesn’t come with lines. We draw those ourselves. Of course, without them, the world would be so blurred as to lack definition, though the danger is drawing lines that divide without purpose. Whatever their original intention, they can leave us detached from others, who then appear as aliens, as threats, like the leper whom Jesus heals. Lepers were quarantined. They weren’t simply contagious. They were thought morally accursed. Here’s another example of crossing a line to show compassion. George had been wounded. His mother in Brooklyn withdrew fifty dollars in savings, so that Walt, his older brother, could go to his aid. In the American Civil War, one was as almost as likely to die from medical care as on the battlefield. Fortunately, George wasn’t badly hurt. After visiting him, his brother learned that two other Brooklyn boys were in a Washington Hospital. He decided to visit them as well. Their families would surely be grateful for news. John Holmes, a twenty-one year-old private from a Massachusetts regiment, was laid up with a severe stomach ailment and bronchitis. Since arriving two weeks earlier, Holmes had received no medical care whatsoever. Holmes was glassy-eyed and listless; he had pretty much given up hope. 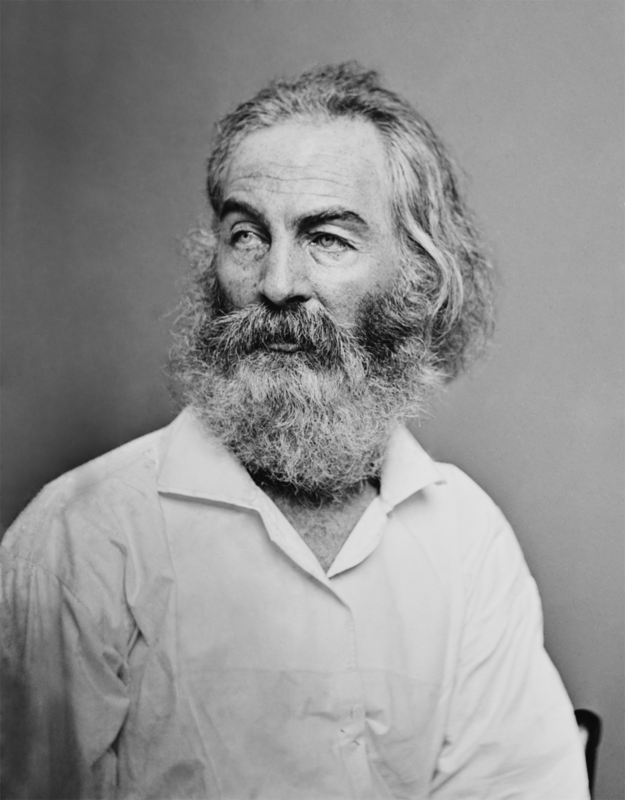 Whitman summoned a doctor and insisted that the ailing soldier be given attention. He also gave Holmes a few coins to buy a glass of milk from a woman who was circulating the ward selling goods. At this kindness, the young man burst into tears (189). spent a great deal of time simply keeping the sick and wounded company, sitting at their bedsides. If a soldier wanted to make diverting small talk, or relive battlefield glory, or unburden himself of a pent-up anxiety, or, overcome by pangs of homesickness, if he wanted to talk about his folks—Whitman was there. “Agonies are one of my change of garments,” he wrote in the poem “Song of Myself”: “I do not ask the wounded person how he feels…I myself become the wounded person” (192). Like Jesus and the leper, Walt Whitman crossed a line, one that had divided him from those in need of compassion. Perhaps an objection is forming: Whitman was attracted to young men, so his motives lacked purity. Yes, but the world would know precious little of charity and care if it were only extended by the utterly disinterested. As easy as it is to draw lines between people, it’s rather hard to demarcate disinterestedness in ourselves. Perhaps another objection: those soldiers suffered for a noble cause! It was their physical wounds, not their moral shortcomings, which had separated them from the healthy and the heedless. Yes, but if sin should be the line that divides—and it surely does. It’s in the very nature of sin to divide—where do we draw that line? Between myself and the sinner? But what sort of blindness—save sin itself—would lead me to conclude that between me and the alienated one—the homosexual, the illegal immigrant, the unwed mother on welfare, the adherent of another faith—there lays a line separating sin from sanctity? No one sets out to sin, to become the alien. Yet it happens to all of us, because it is in the nature of sin to divide, to separate us from our fellows, even from our truest selves. We draw lines, but sin isn’t something that can be contained by them. It scatters within the soul as surely as it does without. It can make ignorance and prejudice look saintly. Sin can’t be circumscribed. It can only be redeemed, and by a savior who summons all to himself. When Erastus Haskell died of typhoid fever, Whitman sent a letter to his parents in Breesport, New York. “I thought it would be soothing to you to have a few words about the last days of your son,” Whitman began. He indicated that the dying soldier’s wish had been to send his love to his parents, brothers, and sisters. He described Erastus as “a quiet young man, behaved always correct and decent, said little.” And Whitman also commented on a fife that lay on Erastus’s bed stand. He had promised to play for Whitman, had he recovered his health. “He is one of the thousand of unknown American young men in the ranks about whom there is no record of fame, no fuss made about their dying so unknown, but I find in them the real and precious and royal ones of this land” (195). Erastus Haskell didn’t die alone or forgotten, because Walt Whitman, like Jesus, crossed a line to show compassion. Life doesn’t come with lines. We draw them. Hopefully, very carefully.